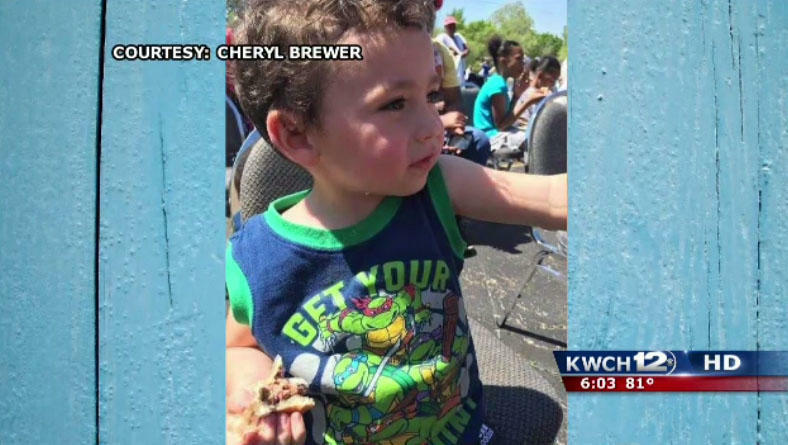 WICHITA -- The mother of a three-year-old boy whose remains were found encased in concrete in a Wichita home in September and her boyfriend have been booked on suspicion of felony murder and child abuse, reports CBS affiliate KWCH. Wichita Police told the station Miranda Miller and Stephen Bodine were booked Monday morning on the amended charges in connection with the death of Miller's son Evan Brewer. Bodine, 40, and Miller, 36, have been in custody for three months on other charges, the Wichita Eagle reports They were charged after the boy's remains were found Sept. 2 with counts related to child custody. The child was the grandson of Kansas gubernatorial candidate Carl Brewer. "I am grateful to the men and women who worked to investigate Evan's death and those who will prosecute the case," Carl Brewer said in a statement released on Twitter. "We have hope the trial will bring justice for Evan and begin healing for our family." The boy's remains were found by a landlord who was cleaning the home after evicting the couple. The landlord discovered a concrete structure and noticed an odor coming from it, Wichita Police said. He contacted police, who discovered the remains that were later identified as Evan Brewer. The landlord told the Wichita Eagle the concrete had been poured into a form sitting in the laundry room of the home. The child had last been seen in July. Prosecutors told the Eagle they will make a formal decision on charges in the boy's death later in the week. The boy's father, Carlo Brewer, contacted state officials and local police over the welfare of his son before his death, who at the time was living with his mother and Bodine. Wichita Police said authorities went to the home, conducted surveillance and contacted neighbors in an effort to locate Miller, who was named in a protection from abuse order issued in July. Police concluded she was eluding law enforcement and had likely left the state. The father's petition for a protection from abuse order on behalf of the boy details multiple reports of abuse dating back more than a year made to the Kansas Department for Children and Families. It cites four complaints dating as far back as July 2016 and as recently as April. One allegation references an injury to his nose and contends the boy was "filthy and without appropriate clothing." One witness statement cited in the order alleges the boy had been beaten "to the point of death" while in the mother's care. There also were protection orders filed against Bodine. "Although we will never get over the loss of Evan, we are extremely relieved to see these charges," Sara Kirby, Evan's stepmom, told KWCH. House Judiciary Committee Chairman Jerry Nadler, D-New York, accused Attorney General William Barr of mischaracterizing the findings of special counsel Robert Mueller's investigation. Nadler says the Mueller report outlines "disturbing evidence" of President Trump's misconduct, and he is requesting that Mueller testify at a Judiciary Committee hearing.